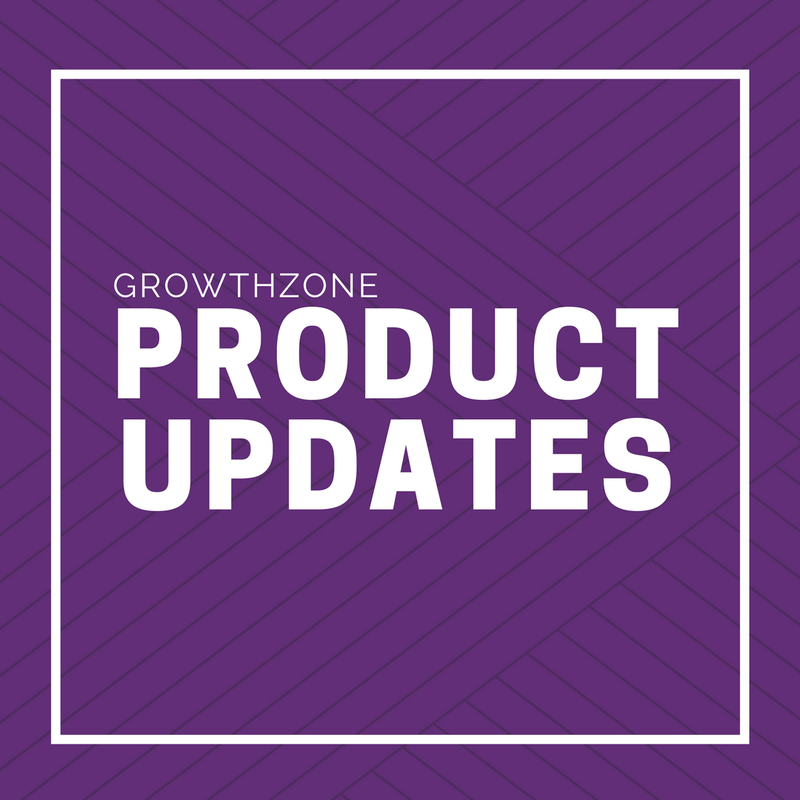 Learn about the new features added to your GrowthZone software in the last two months. CONTACT DESIGNATIONS: You'll now see, when editing a contact's name, there is a new "Designations" field. You are able to add designations, just as you would tags. See how this currently works. DISPLAYING DESIGNATIONS: Along with the Prefix, First Name, Middle, Last, Suffix, and Title, you will now also see Designations within the Name in both the back office and the Info Hub. See an example of this. MANAGING DESIGNATIONS: There is now a page to help manage and standardize designations. For example, if your association has many common designations, you can enter those in this new page. When starting to type into the contact’s designation field (both back office and Info Hub) these standardized designations will then pop up as a type-ahead to select. With having common designation available, it can reduce errors and misspellings. To get to this new page, go to Setup> Miscellaneous, Designations. See example. DIRECTORY INFO: In an effort to clean up the More Info tab of contacts/organization, we've moved the directory information to their respective area, under their directory listing(s). You can locate this contact/organization's directory listings on their Web Content tab. Note: The directory information fields have always been on the directory listing under the web content tab. We just removed it from being edited in two areas of the back office. BETTER DISPLAYING AFFILIATE MEMBER INFO: If utilizing affiliate memberships, you'll now see that the membership status of the individual is shown on the organizations profile page. See a screenshot. Allowing you to see at a glance who is an active affiliate member. We now also have a column displaying the membership type(s) of the contacts in that organization, on the "Individuals" tab. See a screenshot. REORDER REGISTRATION TYPES: You are now able to re-order your event registration types. You'll see that you can drag and drop your registration types into the desired order you want them to appear on the event registration from. See a screenshot. To see this, go to your Event> Attendee Setup Tab> Registration Types area> hover over the registration type, and drag to reorder. SESSION LEVEL CERTIFICATIONS: You are now able to tie an event session to a specific component of your certification. Meaning, end users are now able to earn credit/hours for attending a specific session. To do this, navigate to your event> sessions tab> add/edit a session> and you will now see a certification table. This allows you to add the component(s) that this session will count towards. See where this is. When the staff members then marks that attendee as "attended" in the specific session they will earn the credit/hour(s). This feature requires our certifications module. For more information on this add-on module send us an email at info@growthzone.com. EVENT SESSIONS: You will now see that when an event has sessions added to it, there is an "Event Sessions" button located on the public event details page (right next to the "Register for Event" button). When clicking that button you will now see a stylized page outlining the sessions that are available. See example sessions page. EVENTS SUBMITTED FROM THE HUB: We have updated the way Staff Members can auto-approve events submitted from the Info Hub. Previously, the auto-approving was done with Info Hub event access levels set to full control. We have now simplified the process. There is now a new setting, located under Setup> Info Hub Settings, that allows you to enable "Auto Approve Events Submitted from the Info Hub" for all Info Hub users. See where this setting is. This setting is not enabled by default, meaning, events will not be set to pending approval. In conclusion, event auto-approval will no longer be controlled by access levels, and will be much easier to set. HUB EVENT EDITING: Now, when a member/non-member submits an event from the Info Hub to be added to the calendar, that user will have the ability to go back and edit their submitted event, if needed. Users could not do this previously. DOWNLOAD ATTENDEES: You'll now see that when you choose to Download Attendees (from your event's Attendee Tab> orange Actions button> selecting "Download Attendees"), you will get a pop-up screen that allows you to choose which attendee status' you want to include in the download. See a screenshot. This allows you the flexibility to just download those that you want to view. EASIER REFUNDING: When on the attendee purchases tab, you are now able to quickly and easily refund the payment, using the attendee's gray actions button, and selecting "Create Refund". See a screenshot. OVERVIEW TAB: Now, when you click on the “Accounts Receivable over 90 Days” value shown on the Billing Overview tab, you are brought to the A/R report. All the staff member will need to do is hit "Run Report" to see how that number they clicked on is derived. The totals that are shown will now accurately match the original value you clicked on. This is due to the work we’ve done to implemented the new "Day Overdue" field on the A/R report. See a quick video of this small but helpful improvement. PENDING DELIVERY: When staff send out invoice emails from the Pending Delivery tab in Billing, if the emails send out, the invoices are removed from the Pending Delivery tab. But, in the case of invoices that are addressed to invalid email addresses, the invoices will not be removed from the Pending Delivery tab, and instead switch to say "yes" in the "Missing Info" column. When you click on pending invoices' "yes" it will open up the dialog to recheck and validate the email address. Those pending invoices that actually don't have an email address, the functionality of clicking "yes" in the "missing info" column, will stay the same. See an example of where this is located. INVOICE MESSAGES: You can now easily add an invoice message using the type ahead feature while in the edit invoice screen. See a video of where this is done. This allows you to quickly and easily use the messages that are created in Setup> Message Templates. You can even create a message template on the fly, using the plus button. RESEND INVOICES: When resending an invoice email, from either the Contacts Billing tab, Billing Sales/Invoices tab, or Event Attendees Purchases tab, it will remember what you sent previously and fill it in for you. You can then review your previous message, make text edits if needed, and click send. Helping you save time! See a video of this in action (no audio). MULTIPLE REPORTS: We have added the ability for staff members to pull a specific date range from their date custom fields. See a screenshot. USER ACCOUNT REPORT: We have added the ability to "add to list", meaning you can now pull this report and add those results(contacts) to a list/committee. A/R REPORT: Customers commonly want to filter down to only those that are older than X # of days. Instead of having to manually add that filter to the Criteria section, we have now made it one of the standard filters at the top. You will now see a "Days Overdue" field where you can enter in any number of days. See where this. RECOGNIZED INCOME REPORT: This report will now include recurring invoices that are recognized one time. We've also fixed a couple bugs that were not including future items that are yet to be recognized. ACCOUNT & MEMBERSHIP NUMBERS: You will notice that there is now a new settings screen that allows staff to turn on Account and/or Membership Numbers. To find this new screen, go to Setup> Miscellaneous, Account and Membership Numbers. See what this screen looks like. IMPORTANT NOTE: Account numbers and membership numbers will not automatically be implemented retroactively. Meaning, when this feature is enabled, any existing contacts and/or previously setup memberships will not populate with the intended account /membership numbers. It will start with any new contacts/orgs created. Contact our support team if you have questions, as we can help price out a quote (if needed) for a mass update of your data. Enforce account number uniqueness (meaning, warnings will pop up when editing account numbers, letting you know when that number is already in use). Note: Membership number uniqueness is still in development. MEMBERSHIP APPLICATION: We have added a new setting on your membership application, that allows staff members to hide the price of the memberships until end users reach the payment widget. Meaning if enabled, all the memberships on that application will NOT display the price of the membership on that first page of the application. The setting to control this is located under Membership Module> Membership Application tab> select application name> enable the "Hide Pricing on Membership Selection" checkbox. See a screenshot. DIRECTORY- RELATED CONTACTS: There is now a new setting that allows only those that have active memberships within the organization, will be listed on the directory. This feature is something that our Builder associations will most likely be the biggest users of. To accommodate this new setting, the directory display settings screen now has a new section titled "Display Related Contacts" and the previously existing "Show Related Contacts" and "Show Primary Contact/Organization" fields are there too. See what this looks like. To get there, go to Setup> Directory Display Settings> and choose your directory display setting (make sure to have the Advanced checkbox enabled). This is a premium module that is currently in Beta. For more information on this add-on module send us an email at info@growthzone.com. ACCUMULATE HOURS/CREDITS: We have now added the ability for your Certifications to either have ALL components required, OR meet the minimum number of hours or credits that you specify. For example, maybe you have 15 different opportunities for your members to earn hours/credits, but they only need 6 of those hours/credits to earn the certification. We now support this use case. To control this, there is a new setting for how your members earn their certification. See where this is. Go to your Certification Module> Certifications tab> Add (or edit existing) Certification> Determine Certification completion via dropdown> Choose either "All Components Completed" or "Hours/Credits". When you select "Hours/Credits" additional fields display to allow you to enter specific numbers.